Today, GLCM was excited for their 5th site visit tour. Our host for the day was Walsh Construction at the 505 Tower Project. After an amazing insight and job tour with them at the Ohio River Project in Louisville, we were excited to have a similar experience. The tour began with the GLCM crew meeting up with Nick Boomer, a project engineer who has been with the company for 2 years. We were escorted to the job-site office for a presentation about the project. The building is a high rise residential project. It boasts of being the building with the tallest occupational floors in Nashville.. 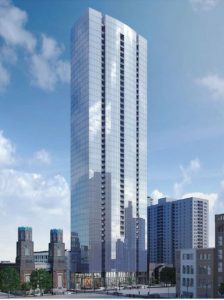 The building is 503 feet tall and would cost the developer, Tony Giarratana approximately $169 million. Walsh construction has been appointed on a Guaranteed Maximum Price of $115 million with shared savings between them and the developer. The duration of the total project is 24 months with phased turnover commencing from fall 2017. Through the presentation and discussion with Nick, the global leaders gained a lot of insight into high rise building construction, specifically in a market like Nashville. We learnt about the challenges of working in a non-union market, and how the company was trying to mitigate some of those risks. 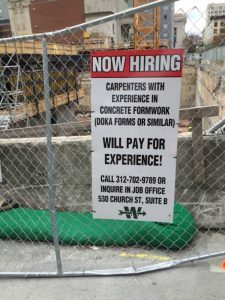 With a construction boom going on currently, there is a big labor shortage that majority of the contractors in Nashville are facing. The picture below was taken right outside the jobsite, which is a rare sign in a market like Chicago as it is a union market. One challenge that the contractor faced when they arrived on site was that the excavation pit was filled with water that was intoxicated with chemicals from concrete washout from the neighboring site. Walsh had to filter all the water before disposing it in the sewer. The soil strata below the site had enough bearing strength that there was no need to drill any caisson foundation. But for structural stability, rock anchors had to be drilled more than 20ft into the ground. Walsh faced challenges while executing this during the winter, as the cold would freeze the grout making it difficult to pump it into the ground. Constructing next to an active construction site also resulted in multiple challenges for the management team. The constrained site resulted in no lay down area for the workers. All the material delivery would need to be planned in a way that avoids the need for a lay down area. Also care had to be taken that cranes on the neighboring site did not obstruct the swing radius of crane on the 505 project. Thus the presentation highlighted a lot of challenges that we might come across our careers as construction managers in the future. After the presentation, we were fortunate to walk around the jobsite and see firsthand how the tower was getting executed. The core of the building is erected using a self jacking formwork system developed by Doka. The picture below shows the self jacking formwork on site. We got an opportunity to see the system from the inside. The concrete foreman, Mr Benson took time out from his busy schedule to show us around. It was an amazing experience, navigating through the different levels and areas in the core, and learning about how the workers achieved the high levels of productivity. This innovative system allowed the crew to achieve a 4 day floor cycle. Overall this was a great insightful tour for the global leaders. 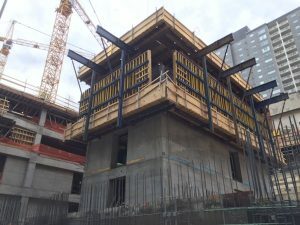 We would like to thank Mr Nick Boomer, Kevin Schaffer and Mr Benson for taking the time out of their busy schedule to help educate us about high rise building construction.